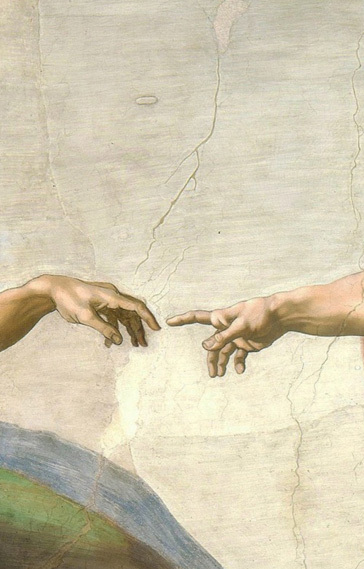 The creation of Adam is probably the most notorious Michelangelo’s fresco on the Sistine Chapel’s ceiling. The painting was commissioned to Michelangelo by the newly elected Pope Julius II and he completed it in barely 4 years. Just four years to entirely cover a 400 square meters surface: what a record! 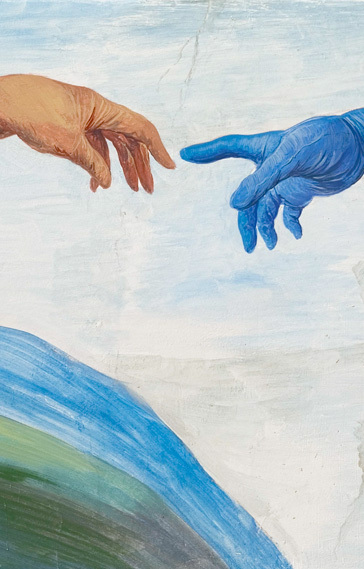 The fresco depicts the creation according to the book of Genesis (2, 4-7) by connecting Adam’s birth to the divine touch, rather than to God’s breath of life on Adam’s face (as classic iconography goes..). The scenery is not contextualized neither in time nor in space, tightly compressed within the architectural elements in order to point out both the vitality and grandiosity of the event. Fingers are not touching each others, a blank space lies in between as two extreme poles of a voltaic art where the spark of life blows up. In this “sacred and tiny space, where the infinite of the invisible and mystery dwells”, life, struggle and cooperation between God and Man’s hand take place. Adam was wandering happily and lazily around the Eden garden, a very cozy place with 7-stars comforts, as everybody knows. What very few people know is that Eve came up with small tasks for keeping Adam busy and to prevent him to become depressed. Tiny assignments such as mowing the lawn, rose trimming, fence painting and even feeding the orphan tiger’s puppies. By all means the garden was a safe place. Nonetheless, Adam lacked any kind of toolkit to perform the tasks, so merciful God called him to himself and provided him comfortable and protective working gloves, just with a spark. Marco Rindori’s painting frames exactly this moment, a kind of brand new Creation. Now, Adam walked proudly across the Eden Garden with his gloves always on. But one day the Devil, disguised as an hypnotic snake, proposed him a deal: trading his Hyflex gloves off for another kind of gloves that could grant eternal life. Adam did not falter and he said: NO. * 7 stars Hotel ★★★★★★★. Currently, there are only six “7 stars Hotel” worldwide and 2 of them are based in Italy. More precisely in Milan and Venice. *The forbidden fruit. Seemingly, an ancient Latin version of the Old Testament reported the word “pomum”: this term was mistakenly translated as apple even though it indicates a fruit, in a broad sense. During the Middle Ages everybody knew that the fruit was actually a fig rather than an apple. This summer fruit symbolizes fertility, abundance and the idea of sexuality, as reported in the apocryphal of the Old Testament better known as “The Apocalypse of Moses”.